Implementing software can be a costly process, between the expense of the software and the time and labor it takes to complete the process. But, I urge you to invest time and resources in the reporting features that you’ll need. After all, the last thing you want to say to anyone in the company is, “we used to be able to run that report until we implemented a new software package.” Here’s how this important feature gets lost down the rabbit hole, and what you can do to avoid a potential costly blunder. Unfortunately, in my experience, the sales consultant is busy trying to get you to commit to the software purchase. They either go into more detail on the benefits of the software, or just put you off when you ask for reporting details. Once the implementation is started, the focus again is not on the reporting, but on getting the software installed and implemented ASAP. The software consultant works with many customers at once and needs to keep their utilization rate up. 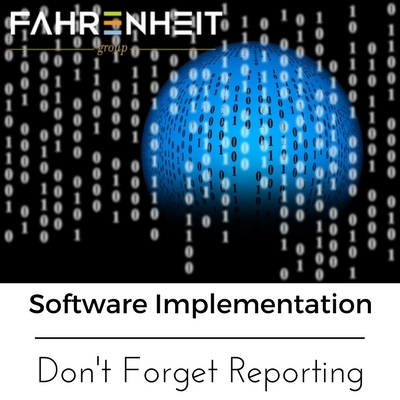 Proper software implementation planning should include a separate plan for how reporting will be implemented throughout the process. Bottom line: If the reporting doesn’t give you the results that you require, the implementation is not complete nor successful. When deciding on a software package, the software sales or implementation consultant should be able to demonstrate reports that can be generated and how involved it will be to create and print reports. Don’t be brushed aside. The software is only as good as the data it can provide you. Smaller software packages usually have a limited number of standard reports and sometimes include the capability of exporting results to Excel where the information can be manipulated and formatted. Standardized reporting limits a company’s ability to customize the reporting to meet their needs. Software packages that provide for report customization can be an advantage, but will require more complex training on the reporting features, which in turn will increase the implementation budget. Often, because reporting usually is implemented last, it is difficult to estimate the actual cost of custom reporting. Implementation fatigue sets in at the end of the process and reporting can be pushed aside in a rush to finish. Once you fully understand the limitations of the software (Step 3), you’ll have an idea of how much customization you will need during the implementation process. If you require a lot of customization, consider hiring an outside independent consulting firm who is familiar with the software being implemented and who can coordinate with the software consultant to save time and money in the long run. New software implementations can easily double or triple in cost if clear goals and processes are not established. An independent consultant can help you focus on your reporting needs to make sure you get the reports that your company needs, as well as help keep the project on track, work to be an advocate for your company, and free up your resources to focus on the day-to-day activities. Implementation projects fail for many reasons, but when you are in the final stages of the implementation, you do not want the project to fail because of reporting. Linda Meade is a consultant and fractional controller for The Fahrenheit Group. She has more than 25 years of accounting experience in small- to medium-sized companies and is proficient in QuickBooks and Great Plains, as well as other accounting software. To engage Linda or one of our other experienced advisors, please contact our office.